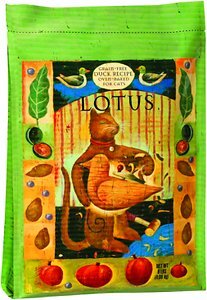 Lotus cat food is a California-based company characterized by juicy stews, patés, and oven-baked kibble wrapped up in whimsical, earthy packages. Their foods are some of the most expensive on the market and they’re often mentioned on lists of the best cat food. 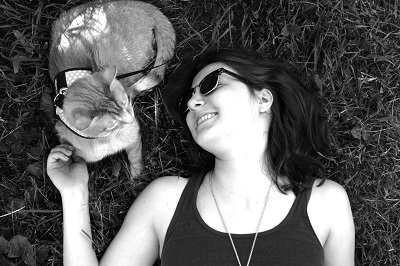 But is Lotus a good choice for your cat? We’ve taken a close look at Lotus and graded it according to the We’re All About Cats standard, evaluating the brand on species-appropriateness, product variety, ingredient quality, price, customer experience, and recall history. Shop for Lotus cat food on Chewy. In total, we give Lotus cat food a 47 out of 60 rating or an A- grade. Lotus was created in 2003 by the owners of Centinela Feed and Pet, a pet specialty store in Los Angeles. Over the years, the store owners watched manufacturer after manufacturer sacrifice quality for cost-effectiveness. Some of their customers’ favorite brands reduced ingredient quality or adopted new manufacturing processes in order to cut costs and increase profit margins. When one of their top-selling brands switched to extrusion instead of baking their dry food, they saw an opportunity. In 2003, Lotus sold their first dog food. Later, they developed the first commercially-available oven-baked dry cat food. Lotus sources ingredients primarily from the United States and Canada with a focus on ingredients grown or raised near their manufacturing locations. Exceptions to this rule are green-lipped mussel, lamb, and lamb meal sourced from New Zealand. All of their vitamins and minerals are sourced from Europe, with the exception of biotin, which they buy from a supplier in India. Lotus dry foods are manufactured in a bakery in Canada. Their wet foods are made in a company-owned micro-cannery in California, where the foods are produced and packed in small batches. Has Lotus cat food been recalled? As of January 2019, Lotus has never been recalled. What kinds of cat food does Lotus offer? Lotus sells both dry and wet cat food. Their dry food is baked and never passes through an extruder. The baking process takes about three times longer than extrusion, but, Lotus says, it enables them to use twice as much meat and allows the food to retain vitamins, minerals, and amino acids present in the fresh ingredients. One of their five dry recipes is grain-free, but most of them are made with whole grains. 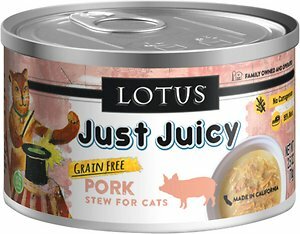 Lotus offers two lines of canned cat food. One is the Just Juicy line, which is made up of six moisture-rich recipes featuring shredded meat in broth. The other wet food line includes five paté foods. All Lotus canned foods are hand-packed in BPA-free cans and are made without xanthan gum, guar gum, or carrageenan. None of their recipes contain artificial colors, flavors, or preservatives. Venison appears to be the primary protein source in this wet cat food. Just Juicy foods are high-moisture stews made from shredded meat and gravy. This leading recipe features venison as the first ingredient, with meat constituting 95% of the entire recipe. Shredded venison is set in a venison broth thickened with agar-agar and potato starch. This Just Juicy stew is primarily made from venison, an unconventional protein source not found in many cat foods. Because venison isn’t common in cat food, this recipe is a popular choice among cats with food sensitivities who can’t stomach the standard fare of turkey, chicken, and beef. It’s a simple recipe with a single protein source and no common allergens. Both sunflower oil and salmon oil are used as fat sources. While sunflower oil isn’t a species-appropriate fat, salmon oil is an excellent source of omega-3 fatty acids. Overall, this meat-based food is high in protein with moderate fat and moderate carbohydrate content. 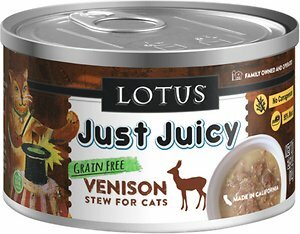 Lotus Just Juicy Venison Stew contains 84.1 calories per 2.5 ounce can. Venison, Venison Broth, Carrots, Potato Starch, Calcium Carbonate, Monosodium Phosphate, Sunflower Oil, Salt, Salmon Oil, Choline Chloride, Agar-Agar, Potassium Chloride, Taurine, Zinc Proteinate, Iron Proteinate, Niacin, Vitamin E Supplement, Thiamine Mononitrate, Copper Proteinate, Manganese Proteinate, Sodium Selenite, Calcium Pantothenate, Vitamin A Supplement, Riboflavin, Pyridoxine Hydrochloride, Biotin, Vitamin B12 Supplement, Calcium Iodate, Vitamin D3 Supplement, Folic Acid. Pork appears to be the primary protein source in this wet cat food. Lotus Just Juicy Pork Stew is essentially shredded pork set in a pork-based broth. The broth is thickened with potato starch and agar-agar. Both olive oil and salmon oil are used as fat sources. Salmon oil is a carnivore-appropriate source of omega-3 fatty acids and can help promote a lustrous coat and supple skin. In addition to meat, broth, oil, and supplements, the food contains carrots, which aren’t species-appropriate and add unnecessary starch to the recipe. Overall, this is a meat-based food with high protein, low fat, and moderate carbohydrate content. There are about 62.8 calories in each 2.5 ounce can. Pork, Pork Broth, Carrots, Potato Starch, Monosodium Phosphate, Calcium Carbonate, Salt, Olive Oil, Salmon Oil, Sunflower Oil, Agar-Agar, Potassium Chloride, Choline Chloride, Taurine, Zinc Proteinate, Iron Proteinate, Vitamin E Supplement, Niacin, Manganese Proteinate, Thiamine Mononitrate, Copper Proteinate, Calcium Pantothenate, Riboflavin, Vitamin A Supplement, Pyridoxine Hydrochloride, Vitamin B12 Supplement, Biotin, Potassium Iodide, Folic Acid, Vitamin D3 Supplement, Sodium Selenite. Duck and duck meal appear to be the primary protein sources in this dry cat food. This popular oven-baked food is Lotus’ only grain-free dry recipe. It’s made with whole green peas, sweet potatoes, and tapioca starch instead of corn, soy, wheat, and other grains typically used as dry cat food binders. The recipe features duck as the first ingredient, followed by duck meal as a concentrated source of animal protein. Pork liver is added as an additional source of animal-sourced nutrients. The food also contains protein from turkey meal and dried egg product, but doesn’t appear to contain plant protein concentrates commonly found in other dry cat foods. The food contains fat from a mixture of animal and plant sources—olive oil, soybean oil, and salmon oil. Overall, the food has moderate protein content, low fat, and high carbohydrate content. Each cup of Lotus Grain-Free Duck dry cat food has about 417.7 calories. Duck, Duck Meal, Pork Liver, Whole Dried Green Peas, Dried Egg Product, Pea Fiber, Tapioca Flour, Turkey Meal, Sweet Potatoes, Brewers Dried Yeast, Organic Soybean Oil (Preserved with Natural Mixed Tocopherols and Citric Acid), Natural Yeast Flavor, Olive Oil, Salmon Oil, Carrots, Apples, Clams, Garlic, Blueberries, Pumpkin, Spinach, Sea Salt, Calcium Sulfate, Iron Sulfate, Zinc Oxide, Niacin, Vitamin E Supplement, Folic Acid, Vitamin B12 Supplement, Copper Sulfate, Manganese Oxide, Dicalcium Phosphate, Potassium Chloride, Dried Kelp, Yucca Schidigera, Inulin, Dried Lactobacillus Acidophilus Fermentation Solubles, Dried Lactobacillus Lactis Fermentation Solubles, Dried Lactobacillus Casei Fermentation Solubles, Vitamin A Supplement, Sodium Selenite, Thiamine Mononitrate, Calcium Pantothenate, Riboflavin, Pyridoxine Hydrochloride, Biotin, Vitamin D3 Supplement, Calcium Iodate, Rosemary Extract. What do customers think of Lotus cat food? Lotus receives primarily positive customer reviews, earning most of their product listings three and four-star ratings. Customers appreciate the ingredient quality and most say their cats loved the food. The food’s inconsistency is a common theme in negative reviews. Unhappy customers say that some cans are full of water with only a few shreds of meat. Others say the cans arrive partially full. Then there’s the fact that Lotus is one of the most expensive cat food brands on the market. Even happy customers complain about the food’s price. How much does Lotus cat food cost? Lotus is expensive, particularly if you feed your cat wet food. The food has a very high cost per ounce. On top of that, you’ll need to feed more ounces per day compared to other foods. Lotus foods, particularly those in the Just Juicy line, are very moisture-rich, translating to low calorie density. For example, Lotus recommends feeding a 10-lb cat four and a quarter cans of Just Juicy Pork Stew each day. At 78 cents per ounce, this adds up to $8.29 per day. Lotus’ dry cat food is considerably less expensive at around $.79 per day. Overall, is Lotus a good choice? If you’re willing to pay for it, Lotus wet cat foods are some of the best on the market. Lotus foods are meat-rich with little or no plant protein, emphasize high-quality ingredients, and are available in a range of limited-ingredient recipes for cats with food sensitivities and allergies. That said, you can find equally nutritious foods at a lower price. Lotus out-costs brands like Hound & Gatos and Weruva, both of which offer recipes just as biologically appropriate as the ones Lotus sells. Where is Lotus cat food sold? You can buy Lotus almost anywhere, but they focus on pet specialty stores. You won’t find it in any big box stores like Target or Walmart, nor will you find it on grocery store shelves. Online, you can buy it through Chewy, Pet Food Direct, Hearty Pet, Pet360, and Amazon. 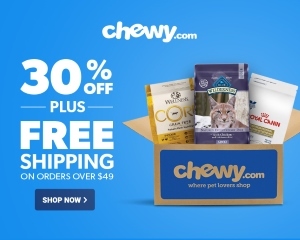 Click here to shop for Lotus cat food on Chewy.